Good morning! I hope this newsletter finds you all in good health and high spirits! All is well at Tagish Lake Kennel. We just finished packing for the 1000 mile Yukon Quest race after another successful visit to the Copper Basin 300 sled dog race. The Copper Basin 300 is known as one of the toughest 300 mile races in Alaska. The route takes you over a few summits and is often in the high alpine. A musher can expect variable conditions and we have seen just about everything on the CB300. Conditions ranging from the 40s down to minus 50, there can be lots of snow, overflow and open rivers. 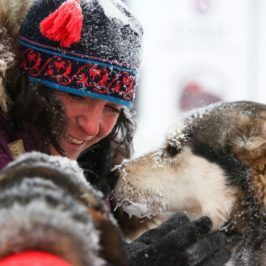 This is what makes the CB300 such a great race to prepare your team for the Yukon Quest. The days leading up to our departure for the CB300 had some very cold temperatures. One very cold day it was minus 46 at night and never warmed above minus 42 for the entire day. With this cold of temperatures we do not run the dogs so we spent our time packing for the race. The morning of our departure temperatures rose to minus 30 over night so Ed made sure the truck started early in the morning and Michelle took the team out for a short run before the long drive to Alaska. Coming into the yard with the team I noticed the hood on the truck open and the truck stopped. I put the team away and Ed told me the truck had quit. He spent a couple hours working on it until he said he had no idea what the problem was. I called our good friend Terry and thankfully she lent us her truck, so we drove into Whitehorse picked up her truck went back home and transferred all the stuff to Terry’s truck. By late afternoon we were ready to hit the road again and we both jumped into the truck, Ed turned it over but nothing happened! Finally after moving the shifter around he got it started. We drove until Haines Junction, and I decided it was better to call it a night as I didn’t think I could make to Buckshot Bettys in Beaver Creek without falling asleep. We woke up at 4 am to do our dog chores and hit the road to Glenallen. After the dogs were fed and put back in the trailer Ed went to start the truck and nothing happened! I texted Terry for advice and Ed kept trying different ideas. After 1 1⁄2 hours Ed said let’s try this one last idea, he crawled under the truck with a hammer and hit the starter as I turned it over. Voila! It worked and we were back on the road! We arrived with 10 minutes to spare at the food drops. I had a brain freeze and turned off the truck but luckily the hammer trick worked again. The next stop was registration and the vet check. I completed our paperwork as Ed parked and got the dogs out of the trailer. All the dogs were given the ok to run in the race and once they were all checked they started howling as they could feel the excitement of the race picking up. Ed had discovered wires loose on the starter and once he fixed those the truck didn’t need the hammer anymore. We had a restful sleep the night before the race and were up early to get our sleds ready to hit the trail. The first run to Chistochina was very soft, the trail hadn’t packed well and many off the down hills it was hard to brake the sleds and the dogs took some tumbles as they dipped snow off to the sides. My time to Chistochina was steady and our handlers Tom and Sidney Huntington were ready to park the team once we arrived. Once the team was parked I quickly started my chores and assessed the team after the soft trail. All of the dogs looked good and were eating well. The wind started blowing hard and all the front runners were wondering who would leave first and be out front to break trail through the inevitable wind drifts. My team was strong leaving and I stood with my foot firmly on the drag for at least the first 3 hours, conserving their energy. Once reaching the high alpine the hard fast trail disappeared and there was wind drifts and tough bottomless trail. We crossed the first open water without incident, although Ed’s team choose to turn a sharp left here and he ended up in water over his boots! The trail then climbs over what is known as “the hump” and down to the Gakona River. This is a long hard climb but our teams did great and never hesitated or looked back. The other side of the hump was very drifted and soft again. The dogs had trouble with their footing and temperatures had risen to about zero degrees Celsius or 30s in Fahrenheit. My dogs had stopped snacking and looked very warm. Luckily the ice was still frozen on the Gakona River and the crossing was solid. In years past I have struggled to pull a team across this river in water up to mid thigh with rapids! Another 6 miles or so of high alpine then we followed the pipeline until Meirs Lake. Arriving in Meirs Lake heavy wet snow had started falling. The team in Meirs looked heat stressed and wasn’t interested in eating their dinner very well. I checked all the dogs carefully and decided to drop Mustang with a shoulder injury. At Meirs Lake we decided to take our mandatory 6 hour rest after the challenging trail our dogs had experienced so far. I ended up feeding the dogs a very heavy breakfast 2 hours before departure as they hadn’t eaten their dinner very well and the team was a bit sluggish leaving the Meirs Lake checkpoint. Snow continued to fall and the next stretch again took us up over a challenging climb and through some windy trail then again on the pipeline road to the Sourdough checkpoint. Sourdough we parked the team and assessed them again. Temperatures were still warm and there was a lot of fresh snow so we decided to take it easier and stop racing hard and break the next long run up with a short camp in the middle. Leaving Sourdough the trail was windy through black spruce and over some small lakes. At the half way point of Crosswinds Lake we stopped for a camping break. I carried soaked food that I fed the dogs for calories and hydration. After our break it was hard to tell that teams were ahead of us with the snow was falling so heavily. It was a long run to the next checkpoint of Mendeltna and I was so happy to see the lights of the checkpoint! The owners of Mendeltna had suffered a huge lose a month previous with their historic lodge burning down. 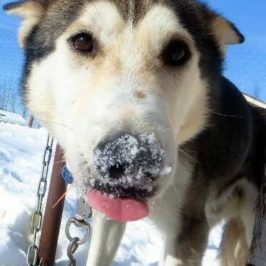 Thankfully they had cabins still open and put up a huge Arctic Oven tent with lots of food, hot coffee and water for all mushers, handlers and volunteers. We enjoyed our break at Mendeltna and had to drop a few dogs because they had a tummy bug. The last run is a long one as it follows the highway then long seismic lines for a long long time and travels past Glenallen then comes back in on the outgoing trail. My team was steady and still not eating super well; I ended up packing Tacoma for a few hours in my sled as he started cramping. We reached the finish line and I hugged all the dogs after the fantastic job they had done! Tom and Sid helped get them all a warm meal and we put them in the straw filled dog boxes for a long nap! Eds team arrived a few hours later and looked great. He had a lot of younger dogs in his team and they were so proud of themselves! They had grown up during these 300 miles!!!! The next morning we fed the dogs a big brunch and repacked the truck. It had started snowing again alternating with rain so we decided we had better hit the road to Tok while we still had daylight. It was a slow snowy drive to Tok and we were happy to reach the Fast Eddys restaurant and motel. We have spent so much time here over the years it is like a home away from home! The next morning we drove back to the Yukon, stopping at Superstore in Whitehorse to pick up more supplies for the Yukon Quest food drops. At Superstore we found we had 2 flat tires on our trailer! Luckily our amazing friends, Avery came to the rescue with a delicious dinner and Derek Crowe had a flat repair kit. We made it home by 11:30 and the dogs were happy to be home! However the next morning we were up early and ready to conquer the Yukon Quest food drops. Hundreds of lbs of dog food, human food and anything else one would need in a 1000 mile race had to be ready to be bagged up in 40 lb rice sacks and delivered to Whitehorse by Saturday. Late Friday evening we had the truck packed with1600 lbs of supplies for Ed’s Yukon Quest and my Yukon Quest 300 race. These final days before we head to Fairbanks for the Yukon Quest is focused on dog care and getting everything else ready for the big trip. 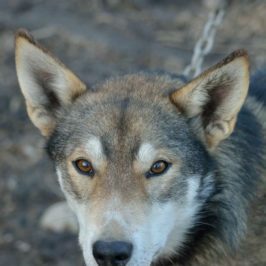 In addition I will need to pack my food drop bags for the 1000 mile Iditarod race so they can be delivered to Fairbanks. Thank you so much for your support! The starting line is coming closer each day! 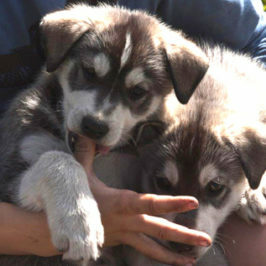 I will send out another newsletter with our dogs for the YQ1000 and the YQ300.